The best musicians on the best stage in West Jordan! We always encourage dancing! (check schedule for dates of dance bands). All our concerts are free and open to the public! The Viridian Center is next to a park, so feel free to bring your kids and let them have fun while you enjoy the music. 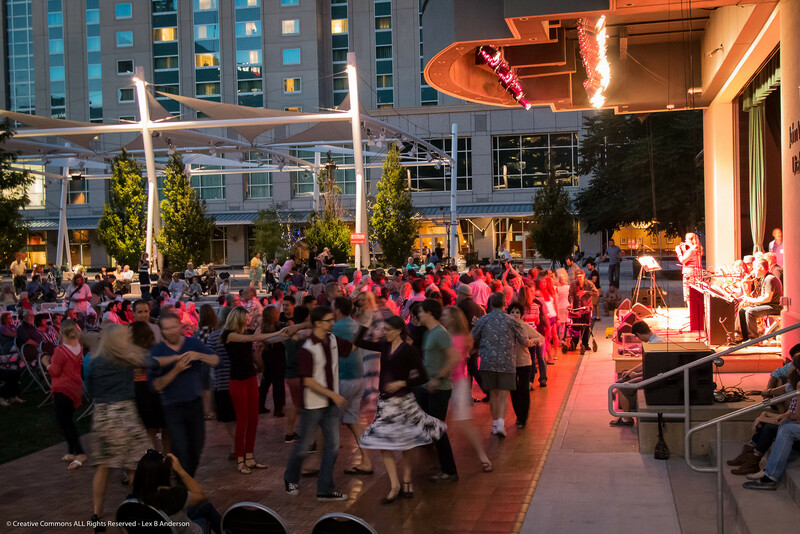 During summer we take our concerts outside to the Viridian Center’s outdoor stage. On a cool summer night, enjoying music is the best thing in the world. And the sun won’t be in your eyes! During the colder months, we host the concerts indoors. We have plenty of space and enough comfy chairs that you can bring your whole family. Concessions are also offered by the Viridian Center. Get up close and personal with the musicians, you will be able to see and hear everything they are doing. Taylor Audio brings their world class sound engineers to each Excellence in the Community concert. The best parking for Viridian Center events is on the south side of the Salt Lake County Library in their main parking lot. Parking is located at 8030 South and 1825 West, essentially just west of Redwood Road at 80th South. You can easily find the concert hall by walking into the library and following your ears (and the crowd of people heading in that direction) in addition there will be signs leading you the concert. The concert hall is located on the far west side of the building.